Bruichladdich is unique. Some of the oldest rocks in Scotland - Amphibolite Gneiss from 1800 million years ago - and grey/brown sandstones - through which the water, essential for the manufacture of whisky, percolates acquiring various minerals on the way. The specific shape of the stills dictates a unique signature to the spirit made here. 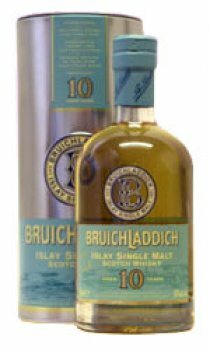 In addition, owing to the lightly peated barley being used, Bruichladdich has traditionally been a less heavy, less peated whisky, and is the most easily approached Islay Malt Whisky having a phenolic content of only 2 parts per million (ppm); Laphroaig has 30 ppm. The seaside location, gives a salty/briny flavour to the whisky aged there. A fresh nose, clean and flowery with a hint of primroses. The palate is lightly creamy with peaches, summer fruits and passion fruit. Zesty, almost effervescent. The finish is where the flavours meld, with a touch of sharpness. Not only the liveliness of youth but also the least wood influence. The use of second fill casks leaves the fruity flavours of Bruichladdich to express themselves more freely.